One of the rewards of coaching children is that of being able to give back to children memories of ones own lifetime in their lifetime. Seeing a child accomplish things for a first time and thinking back over the years, remembering the feelings of ones own. The first story Im about to tell you is possibly my favorite. And I hope you enjoy it. But before you can be able to enjoy it, however, you must be able to transpose yourself back into your childhood days. Try to remember the days when you first experienced things you enjoyed. Maybe it was the first time you drew a picture. Or maybe the first notes on a piano. Or maybe just the first time you were able to receipt the pledge of allegiance. Now remembering the satisfaction you felt when someone close to you complemented you and encouraged you to keep up the good work. Well I wasnt very good at playing the piano. And Michael Angelo was never treathend when I would reach for the crayons. There were some things I was good in. Sports were my specialty. Most of my child-hood days I would be playing all of the sports of the season. During the fall months I found myself playing football. During the winter months playing my favorite sport, basketball. During the summer months my best sport, Baseball. I was very good in all of them. I was the top schoolboy athlete. Quite frankly my year of my eighth grade I was the top player in the entire county not only in baseball, but also in basketball. My greatest honor was receiving a trophy for Hudson County Most Valuable Player. Three of my opponents who I excelled against went on to be very successful professional athletes. But for one moment in time I held the trophy. Now today I find myself not only teaching chess but also coaching baseball and basketball. I believe that Chess , other than family values and education, is the best thing for children. Obviously I have a great love for sports, as well. And although sports in my lifetime took away my actual advancement in chess, (I played very well in chess but never had the time or the proper coaching because of the other sports.) I believe children should be playing games of wonderful physical exercise and enjoyment. One of the things I do not like, however in sports is that the children today are not enjoying the life memories of accomplishment that was enjoyed in the past. Let me be specific. I dont like children joining up on all these different team sports, many times not making any effort or commitment to these teams and then at the end of the season, receiving a trophy for it! Let me get back to this chapter and the beauty of accomplishment. I have a ton of trophies, and all are eighter MVPs or all star teams or one-on-one championships. Most because of individual accomplishments. And the beauty is, I still remember each and every one of them, and where and when I received them. I also wonder if you or anyone else has the same feeling when your child walks from the field with a trophy, you thinking how well your child has done. Then seeing other children who didnt even come to the games walking away with the same trophy. Do you think that parent has the same feeling my mom or dad had when in a room full of hundreds I was announced and rewarded with my M.V.P. trophy. I truly do not think so. 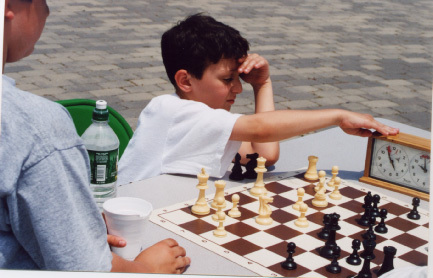 During my first chess camp I was enjoying playing with the children. I had invited a number of children from my after school chess programs to participate in a weekly chess camp. I had never run a camp before but was experienced in other organizations, such as running summer basketball leagues and softball tournaments. So I gave it a try. As the week went on the children were really enjoying themselves. Along with playing with the children, I would give a lesson in the morning and one in the afternoon. I would tell them stories of the history of the game. I was very amazed at the interest the children had for this part of the game. Today I feel this to be one of the main reasons why the children have had so many successes is that knowing the history of this great game, and it is quite a historic one, and keeping the enthusiasm up has been a major reason. I marvel at second and third graders walking down the street not talking of the Yankees or the Mets (all the time) they do of course, but comparing the first official world Chess champion, Wilhelm Steinitz (1886) to former world champions Raul Capablanca or Alexander Alehkine. Tell a child a story and if interested or if you make it interesting they will never forget it! Knowing that chess has been around for 2000 years and its origin, how and why it was created, and all the other reasons why it has stood the test of time is great reason to study this great game. Back to the chess camp. After reading a story of the history of chess I would direct a tournament. Before each and every game we would go over the rules of play. With a raise of hands each child would stand up and mention a different tournament rule. One would shout out the touch and move rule. If you touch it you must move it. The next would say "you must be quiet, no talking" another would reveal the rule of good sportsmanship, "you must shake hands before and after every game" and so on. This was a daily practice. As the week went on there was a distinct difference in the level of play, some children being much stronger than others. I constantly stressed that all the great champions lost chess games and they became better because they would learn from their experiences. This would always relieve the children who were having some difficulties winning some of the times. Some children however would not except defeat very well. There would be a noticeable effect after a loss. Some would cry. Others sometimes would not want to play. This was a very difficult time for me. I wanted all the children to have fun and losing wasnt fun. Damian Ruiz set an example for all to follow. This child showed the others from the very beginning that winning wasnt the only thing. That just playing was fun! Well, this boy would play and play and play. He would learn from my lessons. He would understand all the strategies I would teach and always be able to explain them. One of my rules is that children, to really know something must be able to explain it to others. All my theories and all my ideas were being absorbed by young Damian. Every time I asked him a question he would proudly bashfully answer it to perfection. Now this child simply was not winning many games. He would play and challenge all. Play a well game and just miss winning. He would quietly resign and offer his hand to his happy opponent time and time again and ask to play again. This child was simply the best sport in the entire camp! Now, one of the highlights of the entire camp was an awards ceremony. The accumulation of tournament victories among the children, both individual and in teams was enough to keep all the children happy. As I passed out the many awards the children were very excited. And I had one for each individual child. There was an outstanding player trophy, a High scorer award, and a brilliancy award. There was a ladder tournament champion and a champion of the weekly tournament. There were trophies for a chess contest leader board where children accumulated points on a daily basis for such things as winning as a team, and as an individual or answering chess questions. There was something for everybody. But the one trophy I enjoyed handing out the most was giving to Damian Ruiz. Damian did very well as a chess camper. He learned as much and maybe more than all the other children. He just didnt win often. Damian however was awarded the outstanding sportsmanship trophy. Now something happened in the room that day that I will never forget as long as I live. A moment that will last a lifetime. The flurry of excitement in the room that day was by far a moment that many of those children will remember for years to come. Mario Tridente coming to me, smiling from ear to ear with his outstanding player trophy. First grader Heather McDevit with her high scorer award. All the children coming up to me, thanking me and at the same time gloating. Now this was a very enjoyable moment for me. Not nearly as rewarding as the moment that followed however. This moment will simply never be replaced! As all the children were jumping around happy and happier I then I felt a tug on my shirt. With all the noise around me MTV would have been proud of, I looked down and noticed second grader Damian Ruiz was doing the tugging. As we made eye contact Damian looked not of one who just was honored. He didnt seem to be a seven year old second grader. He appeared as one who needed to make a statement. Damian whispered something to me. With the room of enormous excitement at a high I looked and listened. Suddenly the room, the noise and the commotion surrounding the two of us seemed for one moment in time to silence, almost as if we were in a different place, just the two of us. No MVPs, no tournament winners, no outstanding players, and no other people. Just Damian and me. With this serious look and composed whisper he spoke and without a background sound, I listened. "This is the first trophy I ever won"
Damian Ruiz is a now a regular at my chess academy. Not too long ago Damian won a second chess trophy, and a championship one at that, winning first place at the Childrens chess school of New Jersey tournament. Damian was also a key member in the New Jersey Scholastic State Championships where his school won the State championship, second place! Oh by the way, Damian is still a good sport!